Combining a dual-core x86 processor with an 80-core graphics engine, the SI-08 is capable of supporting resolutions up to 2560 x 1600 along with the latest graphical APIs including DirectX 11 and OpenGL 4.0. It is also capable of hardware accelerated decoding of state of the art video formats such as H.264 AVC, VC-1 (WMV9), MPEG-4 and MPEG-2. A Hybrid-DVI (w/ audio) interface can connect HDMI, DVI and analog CRT displays. SI-08: Signage Player with AMD T56N APU 1.65GHz, 2GB RAM, 320GB HDD, 60W power adaptor. 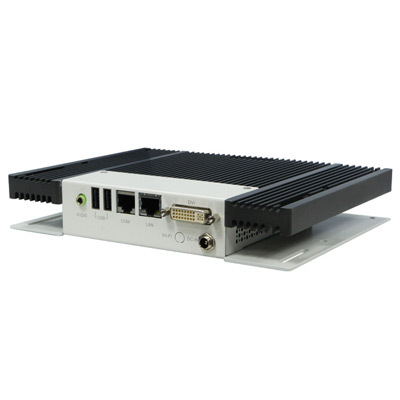 SI-08M: Signage Player with AMD T56N APU 1.65GHz, without RAM, HDD, with 60W power adaptor.